-Treatment = External Fixation. Type IIIB injuries are better treated with IM nailing than external fixation (Dervin GF, CORR 1996;332:10), (Schandelmaier P, CORR 1997;342:164). 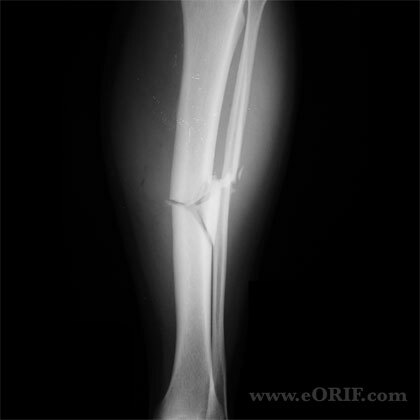 Proximal 1/3 Shaft fracture: Strong tendency for valgus and flexion deformity. -Treatment: IM Nail vs Locked submuscular plating. Knee pain=40-56% (Court-Brown CM, JOT 1997;11:103), (Keating JF, JOT 1997;11:10). Court-Brown, et. al. (JBJS 77-B, No. 3, May 1994) reviewed 33 cases of uninfected non-union of the tibia. Exchange nailing was successful in closed fractures, and open fractures of Gustilo types I, II, and III A. 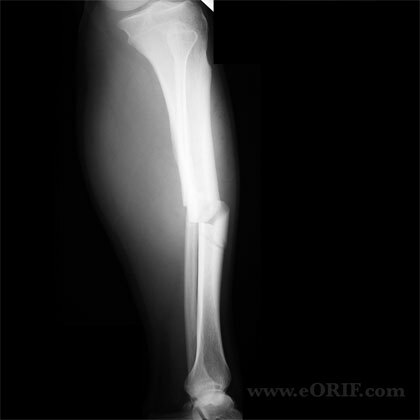 Exchange nailing failed in those fractures with bone loss of more than 2 cm and 50% of the circumference. For these fractures the authors recommend the early use of bone grafting. 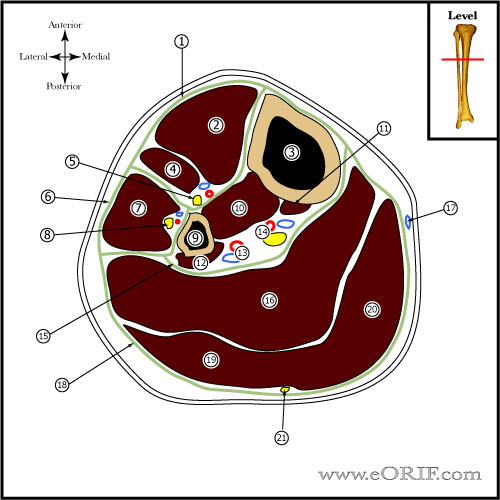 Georgiadis GM, Behrens FF, Joyce MJ, et al: Open tibial fractures with severe soft-tissue loss: Limb salvage compared with below-the-knee amputation. 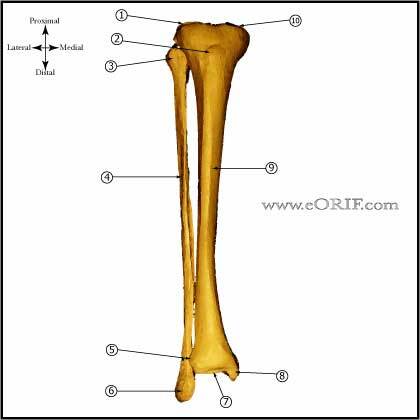 J Bone Joint Surg 1993;75A:1431-1441. 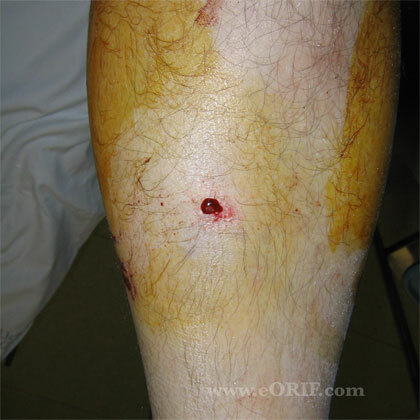 Drischl DR, Dahners LE: The mangled extremity: When should it be amputated? J Am Acad Orthop Surg 1996;4:182-190. 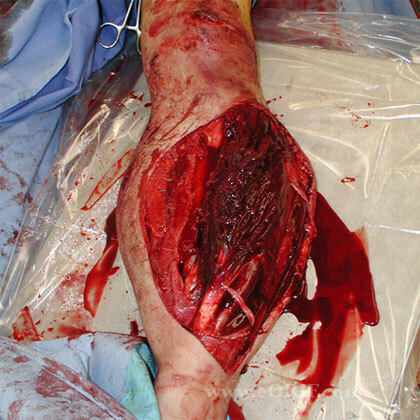 Hansen ST Jr: Overview of the severely traumatized lower limb: Reconstruction versus amputation. Clin Orthop 1989;243:17-19. Sarmiento A. et al. 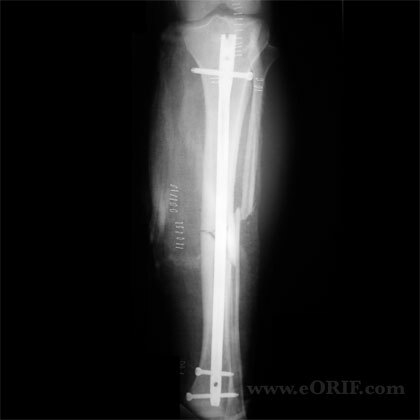 Factors influencing the outcome of closed tibial fractures treated with functional bracing. Clin. Orthop. 1995; 315:pp. 8-24. 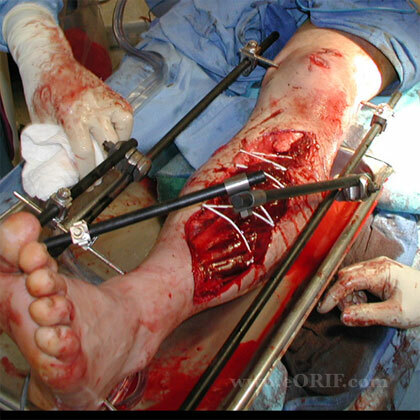 Singer RW, Kellam JF: Open tibial diaphyseal fractures: Results of unreamed locked intramedullary nailing. Clin Orthop 1995;315:114-118. Bone LB, Kassman S, Stegemann P, et al: Prospective study of union rate of open tibial fractures treated with locked, unreamed intramedullary nails. J Orthop Trauma 1994;8:45-49.